Inviting 3 bedroom holiday home near Ajaccio, Corsica. A wonderful holiday home for the whole family with a private pool and brilliant sea views. You’ll find yourself only a few minutes from the blissful Southern French beaches. Sleeps 8. Air conditioning. This beautiful, detached holiday home, with air-conditioning and a private swimming pool, is perfect for an unforgettable stay in Corsica. 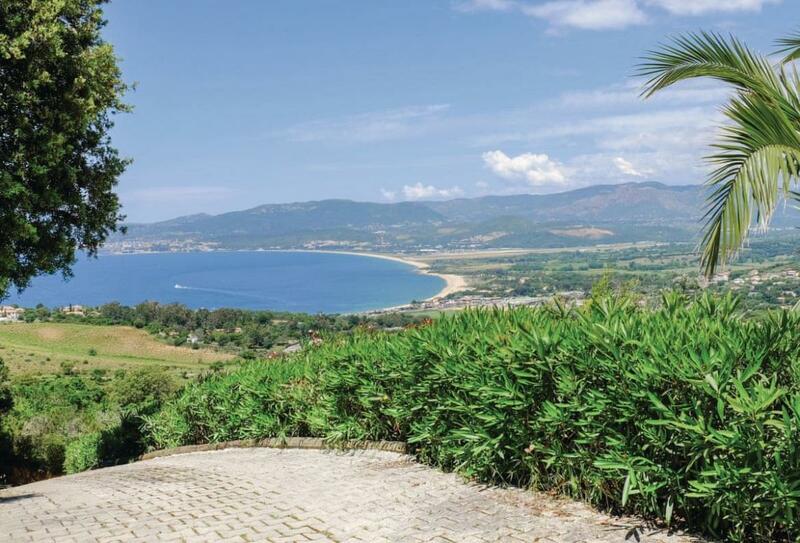 Located only 2km from a beach, it offers an ideal setting for a relaxing family holiday. Ajaccio is definitely worth a visit, with its old town, Musée Fesch and Napoleon’s birthplace. Hiking, horse riding, diving or sailing can also be found nearby. Do not miss the Gulf of Propriano, Lake Melo, the Calanques of Piana or the Gorges de la Restonica, where you can admire all the wild beauty of this exceptional island. Beach 2km. Shop and restaurant 2km. Living area: With French doors leading to terrace. Dining area: With patio doors leading to terrace. Bedroom 1: With double bed and French doors leading to terrace. Bedroom 2: With 2 double beds and French doors leading to terrace. Bathroom: With corner bath, toilet, bidet, double basin, heated towel rail and French doors leading to terrace. Electric heating. Wi-Fi. Cot. Garden with terraces, garden furniture, sun loungers and BBQ. Outdoor swimming pool (private, 49m², open Apr-Oct weather permitting). Private parking for 6 cars. No smoking.